With camera and sensor only one half of the equation, the choice of glass has an arguably bigger impact on overall image quality. With a vast range of lens choices in Nikon’s revered Nikkor line up, as well as third-party options from manufacturers such as Carl Zeiss, Sigma, Tamron, Samyang, Voigtlander, and Tokina, the options are overwhelming. Our engineers have been busy testing as many of these lenses as possible, and we’re delighted to bring you our best lenses for the Nikon D5 review. We’ve analyzed the performance of no fewer than 74 fixed-focal-length lenses on the D5, covering ultra wide-angle 14mm through to super-telephoto 600mm options. To make it as digestible as possible, we’ve grouped these lenses into seven subject categories, including ultra, standard, and 35mm wide-angle lenses, 40 to 60mm standard focal length lenses, short telephoto portrait lenses, super-telephoto, and macro lenses, to help you narrow down the choices. Including an in-depth analysis of the top three lenses in each category, we also highlight the best value option to give you plenty of food for thought when picking out a new lens for the Nikon D5. A “must-have” optic for pros shooting landscape, architectural, or interior commissions, an ultra-wide is defined as a lens with a focal length between 14 to 20mm on the full-frame Nikon D5. We’ve analyzed the results of 10 such lenses, with scores ranging from a high of 37 points on the Sigma 20mm f/1.4 DG HSM A down to a low of 19 points on the Sigma 14mm f/2.8 EX Aspherical HSM. The top three lenses in this category include the $899 Sigma 20mm f/1.4 A with 37 points, the $797 Nikon 20mm f/1.8G with 31, and the $2950 Carl Zeiss Distagon T 2.8/15 with 27. Boasting a wider 15mm focal length and a minimum f/22 aperture, the manual-focus Zeiss is a highly desirable option for landscape and architectural work. Boasting faster maximum apertures, the Nikon and Sigma 20mm options are arguably better low-light ultra-wide options, with improved light transmission over the Zeiss. All three control distortion well, considering the ultra-wide focal length, and particularly so with the 15mm Zeiss, which actually barrels less than the Sigma 20mm, with only 0.5% distortion compared to 0.7%. The Sigma 20mm displays the heaviest corner shading, –2.1EV at the maximum aperture, which isn’t surprising at f/1.4; but stopped down to f/1.8, it produces less corner shading than the Nikon 20mm at the same setting, and at f/2.8, vignetting is virtually eliminated. Both the Nikon and Zeiss continue to vignette at all aperture settings, however, displaying some corner shading around –1EV at f/11, as well as at the minimum aperture settings. With a sharpness score of 19 P-Mpix, the Sigma 20mm f/1.4 A offers the best resolution performance in this category. The Sigma 20mm offers excellent edge-to-edge sharpness and over 70% acutance between f/2 – f/11; at f/1.4, it remains very sharp in the center of the frame, with just a little edge softness in the outer field evident. The Nikon 20mm displays more edge softness at its maximum f/1.8 aperture compared to the Sigma 20mm at the same setting. 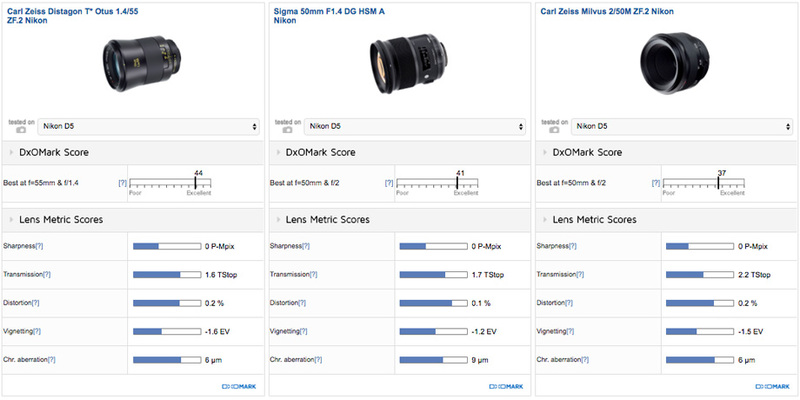 Sigma just has the edge over the Zeiss at f/11, as well as at the lenses’ respective minimum aperture settings. 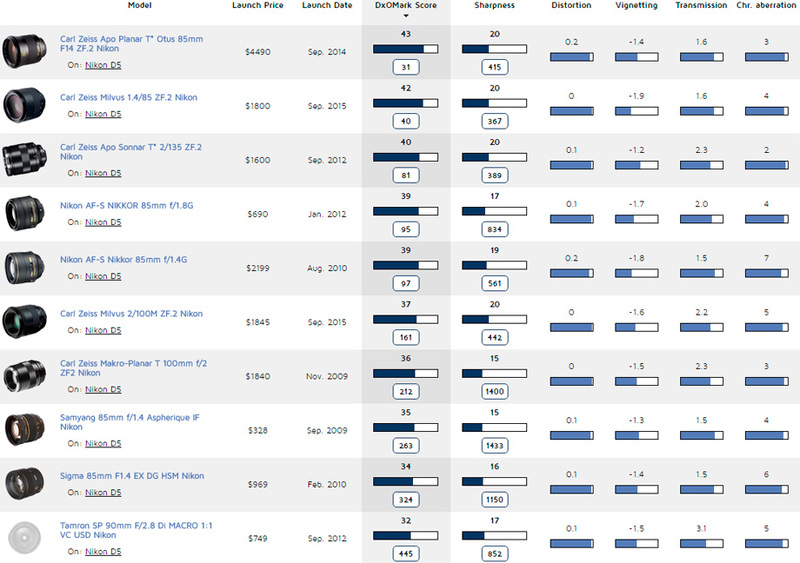 Just $379, the Samyang 14mm f/2.8 IF ED UMC is our best value ultra-wide, ranking in 4th place with 26 points. A manual-focus lens with a f/22 maximum aperture and 14mm focal length, it’s a similar proposition to the more expensive Zeiss and offers good resolution on the D5. In fact, the Samyang is the second-sharpest of all the ultra-wide lenses tested on the D5, achieving a sharpness score of 18 P-Mpix, just 1 point behind the class-leading Sigma. Some edge softness at the maximum f/2.8 aperture occurs, but the Samyang 14mm offers excellent and uniform sharpness between f/4 and f/11, as well as good resolution of around 60% acutance at f/22, which is very comparable to the Zeiss 2.8/15 at this setting. The Samyang does display more vignetting, chromatic aberration and distortion compared to the Zeiss, but these can be corrected in post-production; taking account of the cheaper price point, these might be flaws you’ll be happy to take on board. If an ultra-wide-angle offers too great a field of view for your photography, a standard 24mm or 28mm wide-angle might be the way to go. We’ve tested 11 24-28mm standard wide-angle primes on the Nikon D5, with scores ranging from a high of 37 points on the Nikon 24mm f/1.8G down to a low of 22 points on the Zeiss Distagon T* 25mm f/2.8. The top three include the $747 Nikon AF-S 24mm f/1.8G ED with 37 points, the $1004 Carl Zeiss Distagon T* 25mm f/2 and the $849 Sigma 24mm f/1.4 A, both with 35 points. All three offer fast maximum apertures, with the Sigma 24mm Art lens opening up to f/1.4, but the Zeiss is the only one that stops down to f/22 for longer depth-of-field landscape and architectural shots. All three display heavy corner shading around –2EV at their respective maximum aperture settings, but vignetting is significantly reduced on the Nikon and Sigma between f/4 – f/16. The Zeiss is best between f/5.6 – f/22, but still displays around -0.67EV corner shading at these aperture settings. There’s little to separate the top three for distortion, with all suffering some modest barrel distortion around 0.5%, although that’s not overly concerning for a lens of this type. The Sigma has the worst chromatic aberration score (8um), due to some fringing in the far corners at wider apertures up to f/2.8. At f/2, the Zeiss is the sharpest of the three lenses, with better edge-to-edge resolution compared to the Nikon and Sigma equivalents. The Zeiss also offers uniform resolution at all aperture settings and is at its sharpest at f/5.6 and f/8. It’s very respectable at f/22, too, with overall resolution dropping only to around 60% acutance at this setting. The Sigma and Nikon lenses are not quite as sharp as the Zeiss at any aperture setting, but they’re not far off. Both display some edge softness at their maximum f/1.4 and f/2 apertures, but offer uniform resolution between f/2.8 and f/16. The Nikon lens is marginally sharper than the Sigma at f/16, but there’s not much to it. With a DxOMark score of 31 points, the $499 Samyang 24mm f/1.4 ED AS UMC wins our best value recommendation. A manual-focus lens, the Samyang has a wide range of apertures from f/1.4 through to f/22, making it a good option for both low-light and long depth-of-field photography. 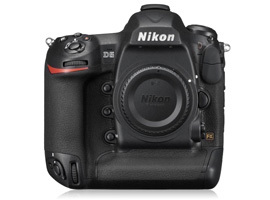 It offers comparable overall sharpness to our top three wide-angle primes, scoring 17 P-Mpix. It is sharpest between f/4 and f/8, with over 70% acutance. At the wider aperture settings it’s good in the center, with some edge softness; and it’s respectable at f/22, too, achieving around 55% P-Mpix. 35mm is a popular full-frame focal length for shooting weddings, environmental portraits, or street photography — in short, whenever you don’t need a really wide field of view, but want to capture subjects within their surroundings. Lightweight, portable, and often equipped with fast maximum apertures, 35mm primes are a great low-light option, too. We’ve tested eight 35mm primes on the Nikon D5, with scores ranging from a high of 39 points on the Sigma 35mm f/1.4 DG A to a low of 25 points on the Nikon AF Nikkor 35mm f/2D. The top three 35mm primes on the D5 include the $899 Sigma 35mm f/1.4 A with 39 points, the $599 Tamron SP 35mm f/1.8 Di VC USD with 37 points, and the $419 Samyang 35mm f/1.4 AS UMC with 33 points. You may have spotted a bit of a trend here, with Sigma Art or A prime lenses consistently ranking in the podium positions. In the case of the Sigma 35mm Art, it’s one of the best prime lenses we’ve tested, scoring a massive 44 points overall on the 36Mp D800E. Again, the third-place Samyang is a manual-focus only option, so it is arguably better-suited for shooting video on the D5. Compared to the Tamron alternative, both the Sigma and Samyang options offer a wide f/1.4 maximum aperture, with better light transmission for improved low-light performance and creative depth-of-field effects. The Tamron does feature image stabilization, however, giving you some flexibility and the possibility of using slower shutter speeds when shooting static subjects. The Samyang suffers more barrel distortion — 0.6%, compared to 0.2% and 0.3% for the Tamron and Sigma, respectively, so it may require a little correction in post-production for perfectly straight lines. There’s no significant chromatic aberration to worry about with any of these 35mm options, however. All three display some fairly heavy corner shading at their respective maximum apertures, but the Sigma is the best at f/2; and while the Tamron and Samyang show some minor vignetting at all apertures from f/4 on, the Sigma entirely eradicates the problem between f/4 to f/16. The Sigma and Tamron 35mm lenses offer very comparable resolution and both are very sharp primes. The Tamron is marginally better in the corners at f/2 compared to the Sigma, but both are an improvement on the Samyang, which displays more edge softness at this setting. While the $419 Samyang 35mm f/1.4 AS UMC in the top three is a good value option, it’s not a choice if you’re after an autofocus lens. The $387 Nikon 35mm f/2D is an older Nikkor option, but it’s still available to buy new, and is a smaller and discreet lens for travelling light or shooting unobtrusively. 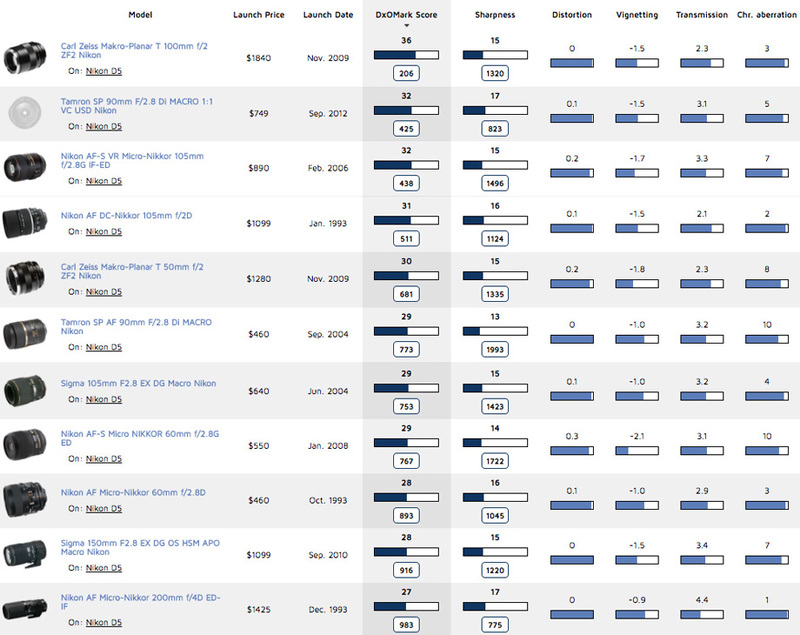 The Nikon 35mm f/2D appears far behind in the scores table — in fact, it’s at the bottom, but this is largely due to its lower transmission score. If you don’t need the fast f/1.4 aperture and better light transmission of the Nikon or Samyang lenses, the Nikon 35mm f/2D has better scores for chromatic aberration, vignetting, and distortion. To be fair, sharpness is better on the Samyang in terms of edge performance, with the Nikon displaying heavy drop off at f/2; further the Nikon isn’t completely uniform at any aperture, but it’s good in the center of the frame between f/2.8 to f/11. Standard prime lenses between 40-60mm offer a field of view akin to human vision and a useful focal length for a variety of subjects and general use. These often reasonably small and affordable units also feature “fast” apertures for low-light photography and creative bokeh effects, as well some of the best-performing optics we’ve ever tested in this group. We’ve examined a total of 16 standard prime lenses on the Nikon D5, with scores ranging from a high of 44 points on the Carl Zeiss Distagon T* Otus 1.4/55 to a low of 25 points on the Carl Zeiss Planar T 50mm f/1.4. 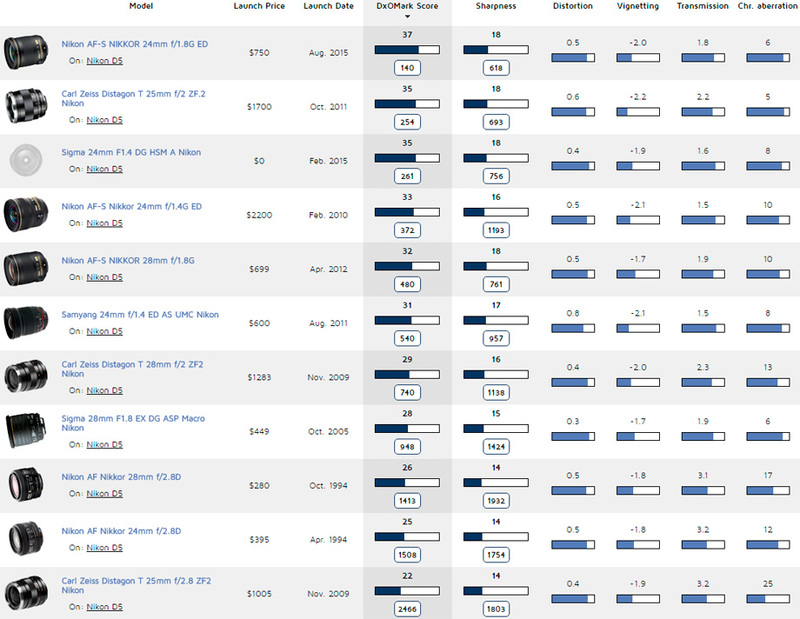 We’ve included the top 10 in the chart below. 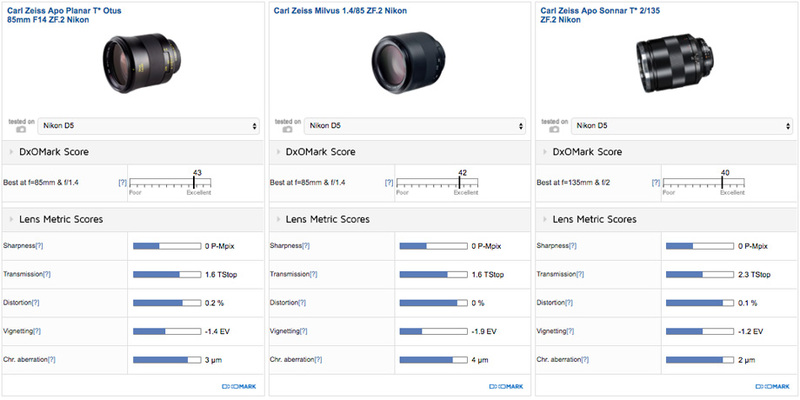 The top three podium positions go to the $3990 Carl Zeiss Distagon T* Otus 1.4/55 with 44 points, the $949 Sigma 50mm f/1.4 A with 41 points, and the $1199 Carl Zeiss Milvus 2/50 with 37 points. The Otus is one of the sharpest lenses we’ve ever tested, but with a $3990 price tag, it is a bit of a stretch for most photographers. Zeiss’s new Milvus range continues to offer first-class performance in a line of cheaper lenses, but both Zeiss options remain manual-focus only, with the Sigma 50mm f/1.4 A the only one of the top three standard primes to feature autofocus. With the Otus 1.4/55, you’re paying for exceptional edge-to-edge sharpness at all aperture settings, and it’s phenomenally sharp using mid apertures between f/2 – f/8. But the Sigma Art 50mm is also exceptionally sharp on the D5. There’s some edge softness in the far corners of the frame at f/1.4, and center resolution isn’t quite as good as the Otus at the maximum aperture either, but it’s not far off. Between f/2 to f/11 the Sigma is also very sharp. The Sigma offers a modest improvement for Sharpness over Zeiss’s Milvus 2/50, which although still very good, displays some edge softness at f/4 and f/5.6, though it remains very sharp in the center of the frame at all aperture settings. The Sigma 50mm f/1.4 A represents great value, with outstanding performance for under $1,000. If that’s still a bit much, the older $299 Nikon 50mm f/1.4D remains available to buy new and ranks among the top five for standard primes on the D5. However, with the exception of transmission, all its lens metrics are down compared to the top three, and drops down from 20 P-Mpix D5 sensor resolution (on the Otus 1.4/55 and Sigma 50mm f/1.4 A, which maximize the sensor’s full potential) to 15 P-Mpix. Resolution at the maximum aperture is also relatively poor and some edge softness at all apertures is evident. Like the Nikon 35mm f/2D previously mentioned, however, the Nikon 50mm is a smaller, more lightweight and discreet option compared to the bulkier top-performing Sigma and Zeiss options, and its size and weight represent other benefits. Portrait lenses offer a short- to mid-telephoto focal length that compresses perspective, keeps facial features in proportion, and helps throw the background out of focus to isolate the subject. Boasting fast apertures, they’re also great lenses for shooting in low light, whether for reportage or for shooting events such as weddings. We’ve tested a total of 19 short- to mid-telephoto (85-135mm) prime lenses on the D5, ranging in scores from a high of 43 points on the Carl Zeiss Apo Planar T* Otus 85mm f/1.4 to a low of 28 points on the Sigma 105mm f/2.8 EX DG OS HSM. 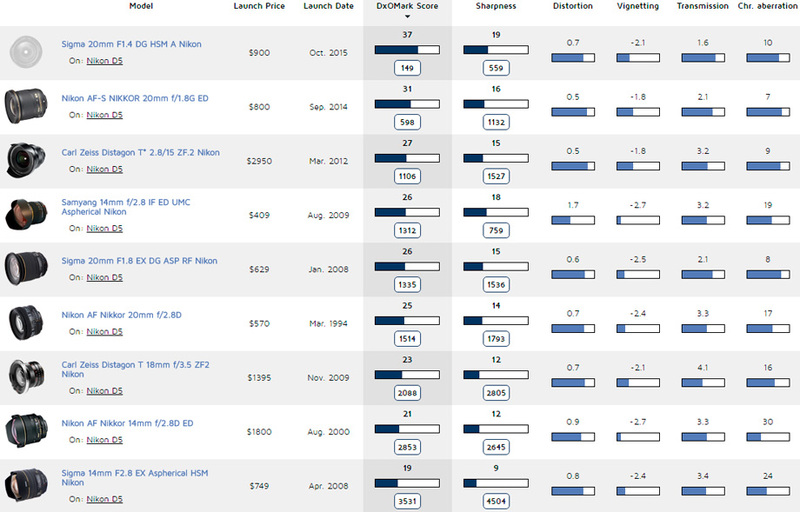 We’ve included the top ten standard primes in the table below. 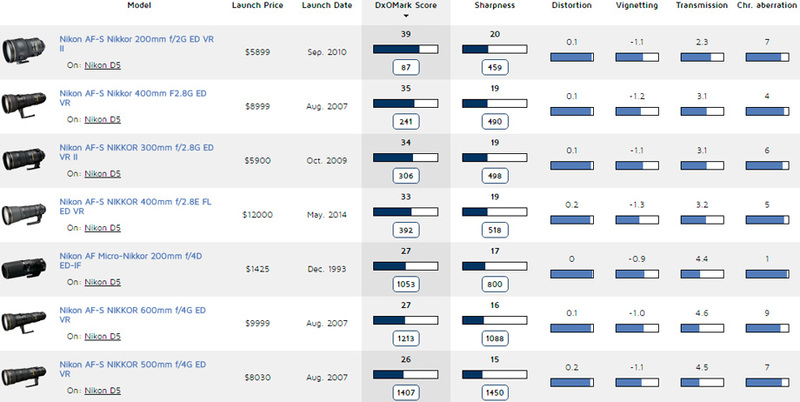 The top three podium positions are all occupied by manual-focus Carl Zeiss options, including the $4490 Carl Zeiss Apo Planar T* Otus 85mm f/1.4 with 44 points, the $1799 Carl Zeiss Milvus 1.4/85mm with 42 points, and the $2122 Carl Zeiss Apo Sonnar T* 2/135 with 40 points. Both 85mm f/1.4 options boast greater light transmission compared to the 135mm f/2, but neither distortion nor chromatic aberration is an issue with these three top-end primes. Using the maximum aperture, they all suffer fairly heavy vignetting (over –1Ev, and nearly –2Ev in the case of the Milvus 1.4/85), but the Otus and Milvus 85mm are significantly better at f/2, and the issue is all but eradicated on all three lenses by f/2.8. All three of these Zeiss primes maximize the full resolution potential of the 20.8Mp Nikon D5, scoring 20 P-Mpix for sharpness, with excellent edge-to-edge resolution at all aperture settings. Otus and Milvus 85mm lenses are little softer overall at the maximum f/1.4 aperture, with resolution dropping down to around 65% acutance, but that’s still very good shooting wide-open, and such strong edge sharpness at f/1.4 is rare. The Milvus 85mm is marginally the sharpest at f/2, but there’s not much in it, and they all offer outstanding resolution of over 70% P-Mpix between f/2 to f/8, which are great settings for your portraits. Costing $477, the Nikon 85mm f/1.8G is significantly cheaper than both the Milvus and Otus 85mm, but offers great performance on the D5, scoring 39 points overall. Compared to the f/1.4 Zeiss 85mm, the Nikon’s a “slower” f/1.8 maximum aperture lens, but that has some advantages in terms of size and weight, as well as obviously price. Further, the Nikon 85mm features autofocus, too. In most categories, the Nikon 85mm boasts comparable lens metrics to those of the Zeiss 85mm, although the Nikon doesn’t maximize the full resolution of the D5, achieving a slightly reduced sharpness score of 17 P-Mpix. This is a result of a slightly lower center resolution overall, but the Nikon 85mm f/1.8G is still a very good short telephoto portrait lens on the D5. The preserve of the professional photographer, or extremely serious sports and wildlife enthusiast, these super telephoto primes combine truly long focal lengths with large maximum apertures to help achieve fast shutter speeds in all lighting conditions. As a result, telephoto primes are necessarily large, heavy, and expensive, featuring big, high-quality glass elements that push the price into several thousands of dollars. We’ve tested seven telephoto prime lenses on the Nikon D5 covering 200mm to 600mm, and scores range from a high of 39 points on the Nikon 200mm f/2G ED VR to a low of 26 points on the Nikon 500mm f/4G ED VR. The focal length most appropriate to the subject is the key consideration in choosing a telephoto prime on the D5. The class-leading Nikon 200mm f/2 is an amazing portrait option, with superb out-of-focus bokeh possibilities, and it doubles as a great low-light lens for events, press, and weddings, too. For sports and wildlife shots, the 300mm and 400mm f/2.8 are popular choices for achieving fast shutter speeds in low light, thanks to the fast maximum aperture. 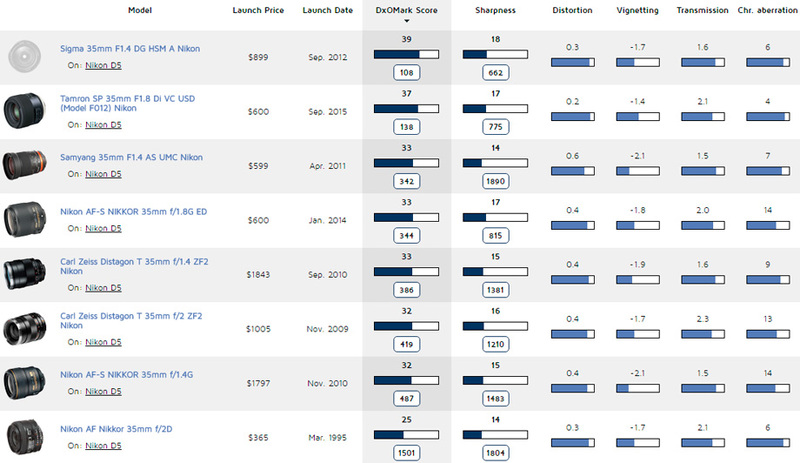 There are 200mm, 300mm, and 400mm options in the top three podium positions, which are the $5700 Nikon 200mm f/2G with 39 points, the Nikon 400mm f/2.8G with 35 points, and the $5497 Nikon 300mm f/2.8G. Note that the older 400mm f/2.8G in 2nd place on the podium has now been discontinued and replaced with the $11,200 Nikon 400mm f/2.8E alternative, which ranks in 4th place. With some slightly better lens metric scores compared to the updated model and the same sharpness score of 19 P-Mpix, the older Nikon 400mm f/2.8G represents great value if you can pick up one in good condition second-hand. With the exception of transmission, there’s very little between the performance and scores of these Nikon 200mm, 300mm and 400mm telephoto lenses — all of which have very little distortion or chromatic aberration to worry about. All display some corner shading of around –1EV at their maximum apertures, but closing down 1 stop significantly improves brightness into the corners of the frame. All three offer outstanding edge-to-edge sharpness over 70% P-Mpix using all aperture settings up to f/11, and the Nikon 200mm f/2 is very sharp and uniform at f/2 when shooting on the D5. The Nikon 500mm and 600mm f/4 super-telephoto primes have even greater reach for certain sports and wildlife subjects. Lower light transmission and sharpness scores mean these options have lower overall scores, but they remain exceptionally good lenses. 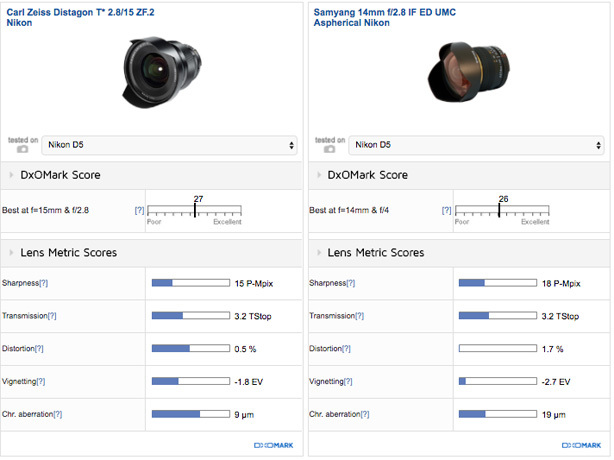 Sharpness scores of 15 or 16 P-Mpix realize a lot of the D5’s resolution potential, and other lens metrics for distortion, vignetting and chromatic aberration are comparable to lenses in the top three, too. Although there’s no cheap option for a telephoto prime, the older $1792 Nikon 200mm f/4D ED-IF is still available to buy new and offers good sharpness on the D5 using wide aperture settings between f/4 to f/11. Macro lenses offer close focus capabilities, with a magnification factor of 1.0x or 1:1 at the minimum focus distance for life-size reproduction of tiny subjects such as insects. These lenses don’t have to be used at the minimum focus distance, however, and as they feature focal lengths between 50-200mm and large maximum apertures, they also double as good portrait and possibly event photography lenses on the D5. We’ve tested a total of eleven macro lenses on the Nikon D5, with scores ranging from a high of 36 points on the Carl Zeiss Makro Planar T 100mm f/2 down to a low of 27 points on Nikon Micro 200mm f/4D ED-IF. 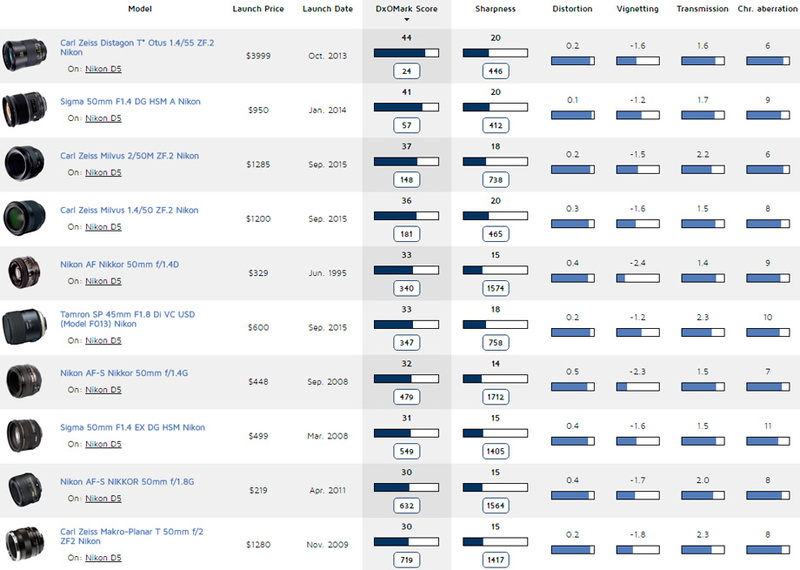 The podium positions go to the $1843 Carl Zeiss Makro Planar T 100mm f/2 with 36 points, and the $649 Tamron SP 90mm f/2.8 Di and $897 Nikon 105mm f/2.8G, both with 32 points. The Zeiss takes the top spot thanks to its superior light transmission, minimal distortion, and best handing of chromatic aberration. The Tamron SP 90mm f/2.8 is marginally sharper overall, scoring 17 P-Mpix compared to 15 P-MPix for both the Zeiss 100mm and Nikon 105mm options. The Tamron’s scores for chromatic aberration and distortion are very close, too, so if you can live with the f/2.8 maximum aperture and resulting lower light transmission, the Tamron is great alternative that costs half the price of the Zeiss. Compared to a minimum aperture of f/22 on the Zeiss, both the Nikon 105mm f/2.8G and Tamron SP 90mm f/2.8 macro options will stop down to f/32, which could be important for long depth-of-field macro shots when you’re working at such close focus distances. The Zeiss is sharper at f/22 compared to the Nikon and Tamron at f/32, where their resolution drops to around 50% P-Mpix. Taking into consideration the diffraction effect, this isn’t surprising, nor is the fact that all three macros offer homogenous resolution at their respective minimum apertures. Using a mid f/11 aperture, all three lenses are comparably sharp at around 70% P-Mpix, with the Tamron just fractionally ahead. For shooting portraits, events, or shallow depth-of-field macro shots, sharpness at f/2.8 is also very comparable across these three macro lenses. Again, the Tamron SP 90mm f/2.8 is marginally ahead, but there’s not much in it, and all offer around 70% P-Mpix at this setting. The Zeiss 100mm’s lowest score for vignetting (–1EV) occurs at its maximum f/2 aperture, but stop down to f/2.8 (the maximum aperture for the Tamron and Nikon equivalents), and the Zeiss’s light attenuation is significantly improved. At $649, this top-performing third-party lens is certainly the best value macro option on the D5. If you need something a bit cheaper, however, its predecessor, the $499 Tamron SP AF 90mm Di, is still available and puts in a very solid performance. As this older model has no image stabilization and a slightly lower sharpness score with some edge softness at the wider aperture settings, the updated version is certainly worth the extra $150.